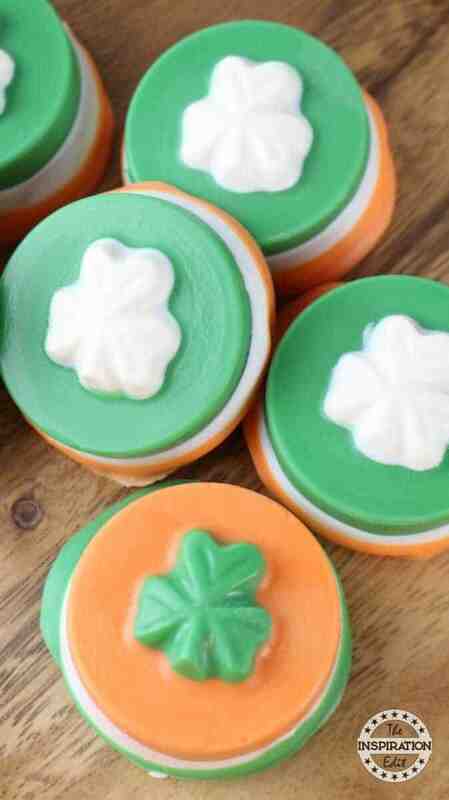 Today we have a really fun activity for Saint Patricks Day. 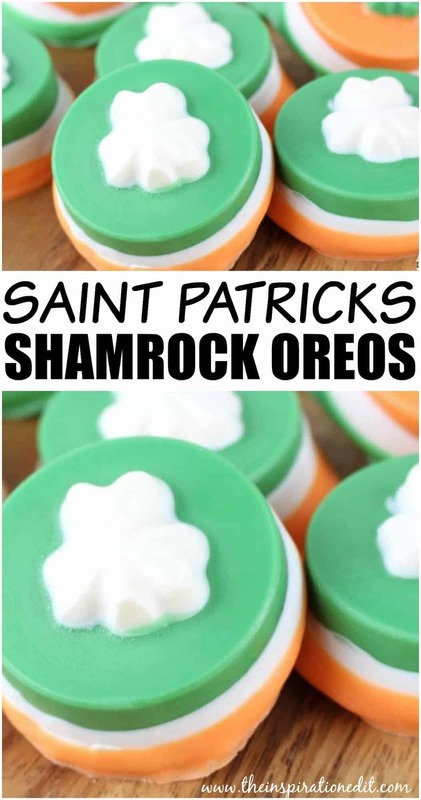 Here is the instructions for making Shamrock Oreo Cookies.It’s going to be lot’s of fun and you can buy the mold from amazon really cheap. 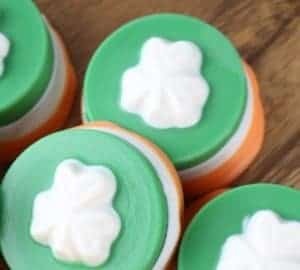 Saint Patricks Day is such a fun time and there are so many fun activities to do with the kids. We hope you enjoy this one. 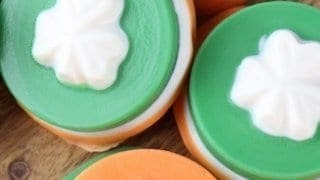 Add 1/4 cup of the green candy melts to a small microwave-safe bowl. Microwave for 40 seconds. 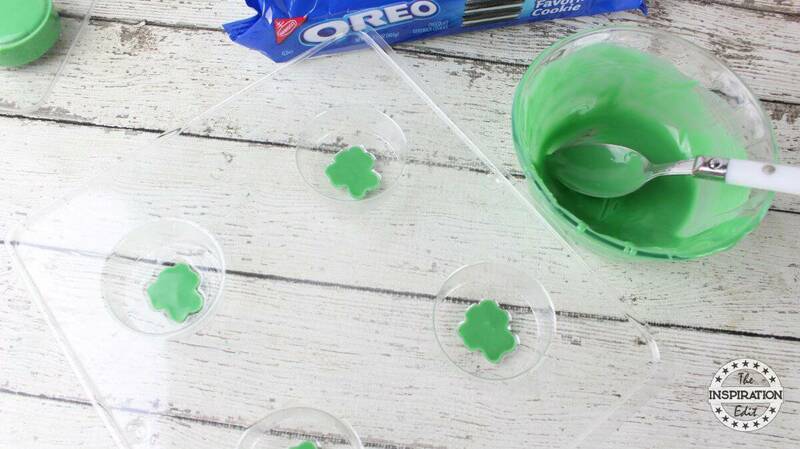 Carefully pour the melted green candy into the shamrock center of 6 of the cookie molds. (I used a teaspoon). 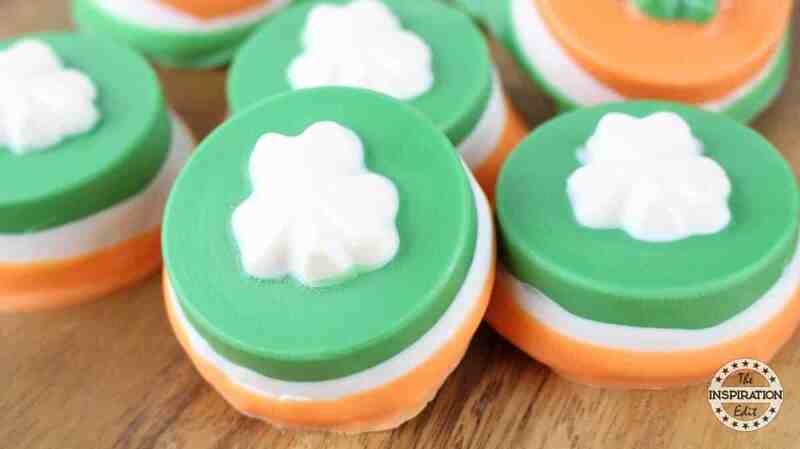 Chill the cookie molds for 10 minutes to allow the green chocolate shamrocks to harden. 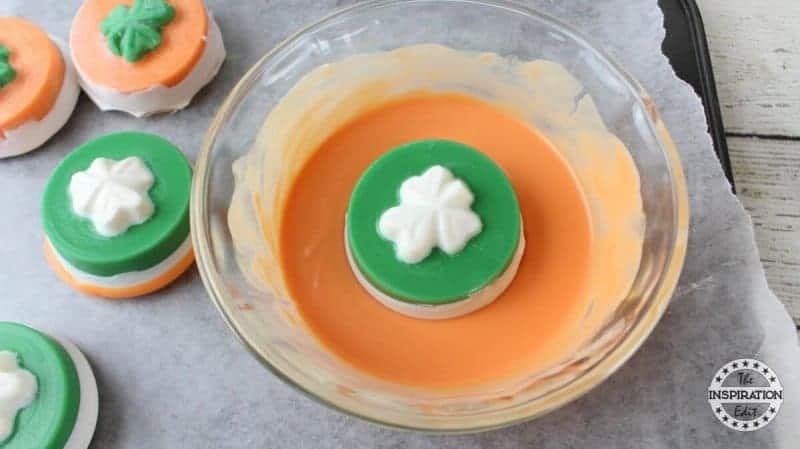 Add 1/2 cup of the orange candy melts to a microwave safe bowl and microwave on HIGH for 40 seconds. 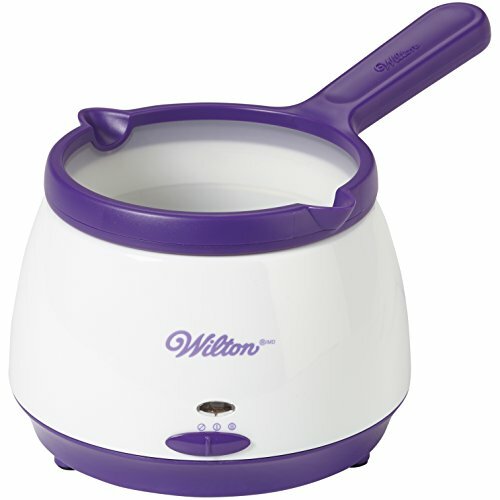 You could also use a wilton melting pot. 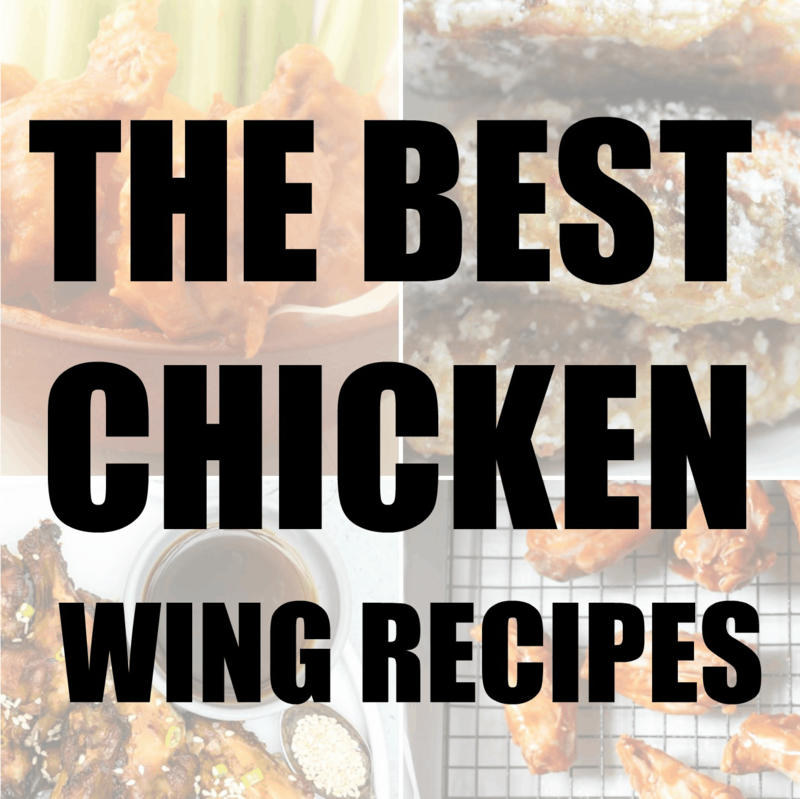 Continue to microwave and stir in 15 second increments until completely melted and smooth. Remove the chilled cookie molds from the refrigerator. Pour 2 Tablespoons of the melted orange chocolate into each mold. 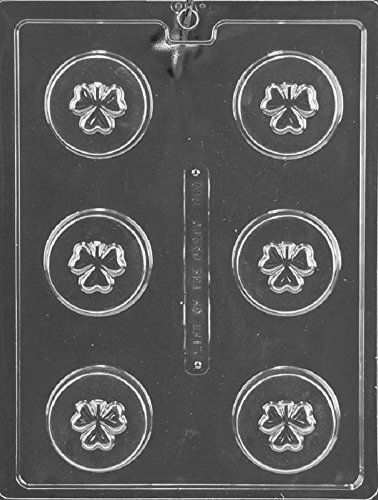 Remove the chilled cookie molds from the refrigerator. 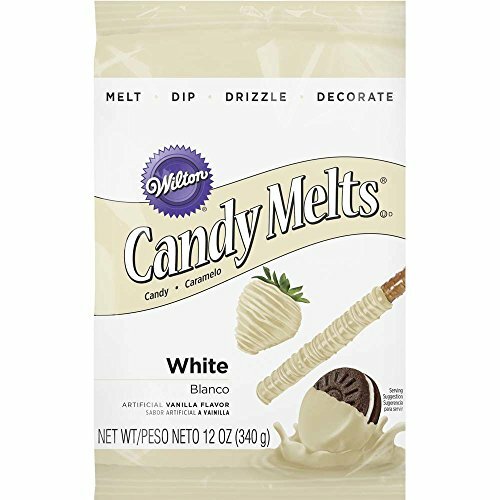 Pour 2 Tablespoons of the melted orange chocolate into each mold. 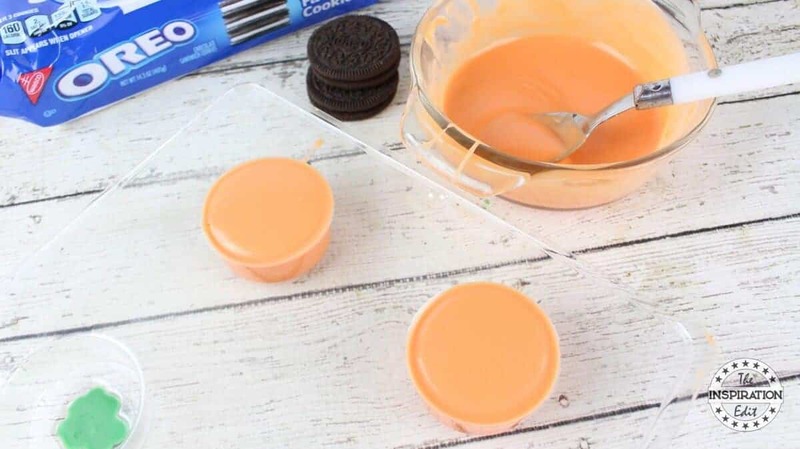 Place an Oreo cookie on top of the melted orange chocolate in each mold. 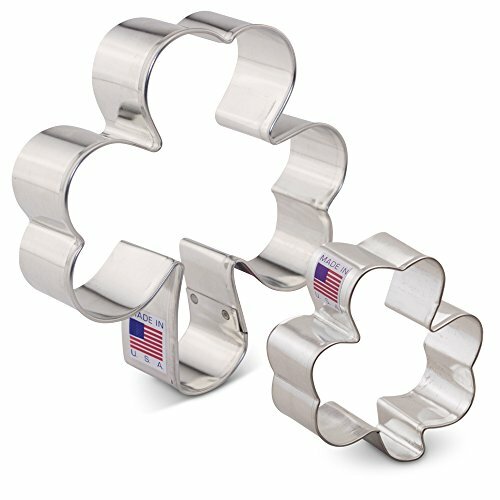 Pour additional melted orange chocolate on top of each cookie, up to the top of each mold. Now repeat the process with Green chocolate. 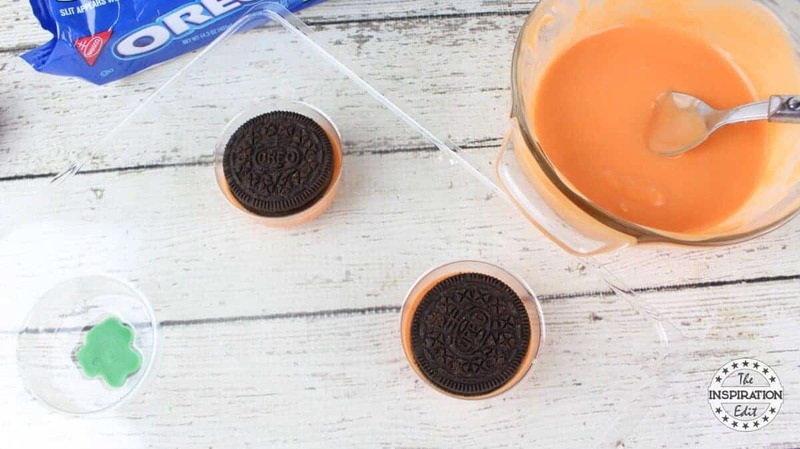 Chill for 30 minutes to allow the orange and green chocolate oreos to harden. Once chilled, carefully pop the cookies out of their molds and place on the lined cookie sheet. 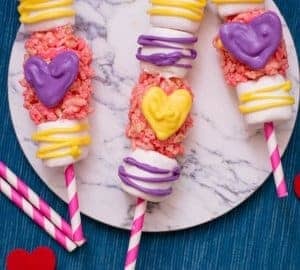 Place 1/2 cup of white chocolate melts in a microwave safe bowl and microwave on HIGH for 40 seconds. 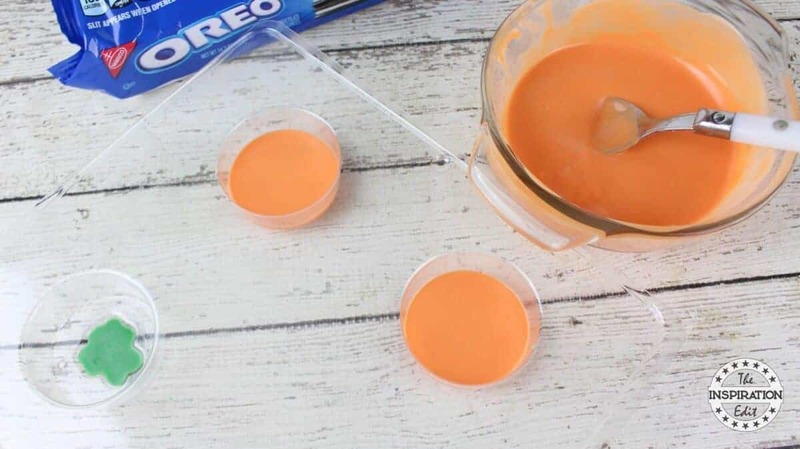 Dip each orange coated Oreo cookie halfway into the melted white chocolate. Return to the lined cookie sheet for 15 minutes to allow the white chocolate to harden. 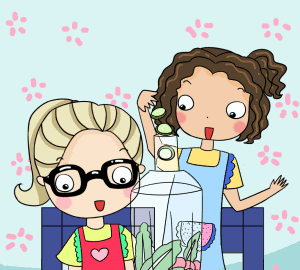 Do the same with the green cookies. 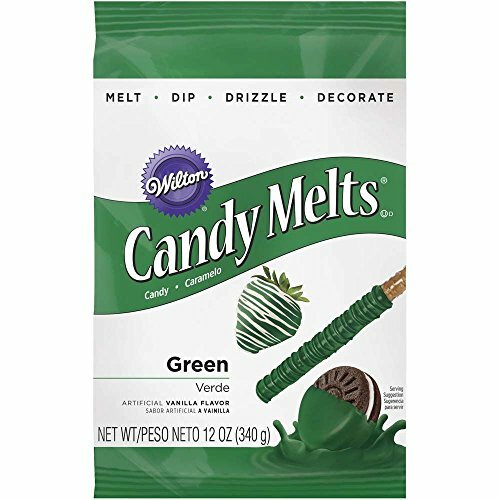 Place 1/3 cup green chocolate melts in a microwave safe bowl and microwave on high for 40 seconds. Stir until completely melted and smooth. 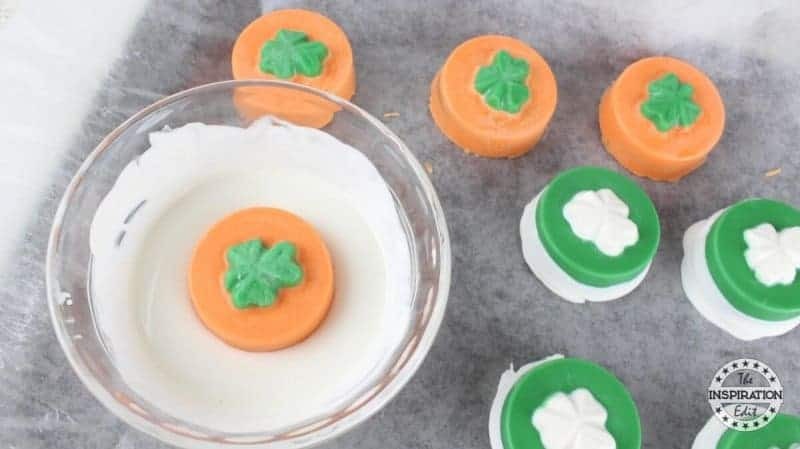 Dip the bottoms of each orange and white Oreo cookie into the melted green chocolate and place back on the lined cookie sheet to harden for 15 minutes. 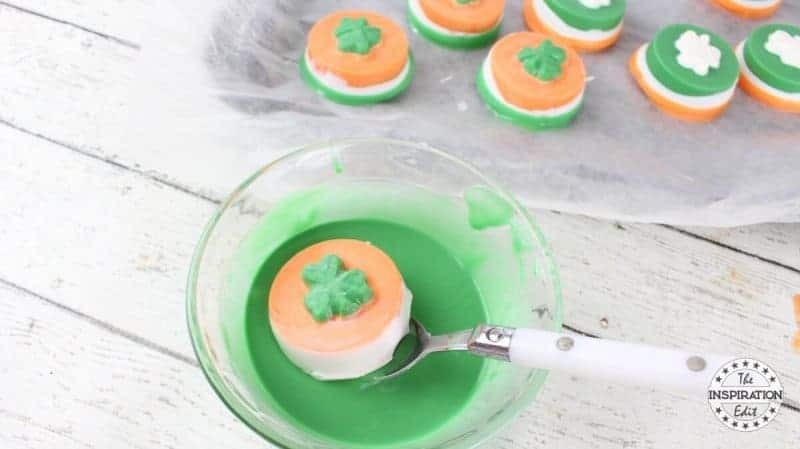 Dip the bottoms of the green cookies into the orange chocolate. 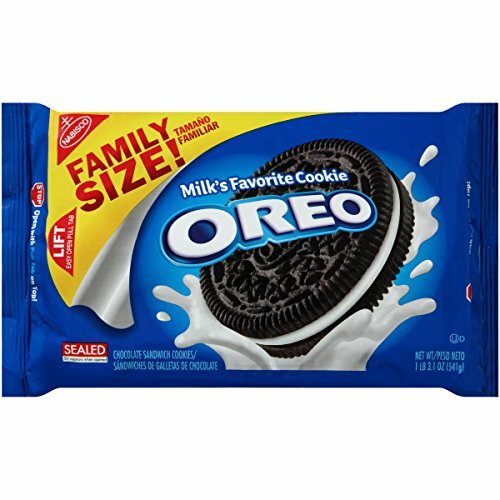 Your Oreo cookies need to set. 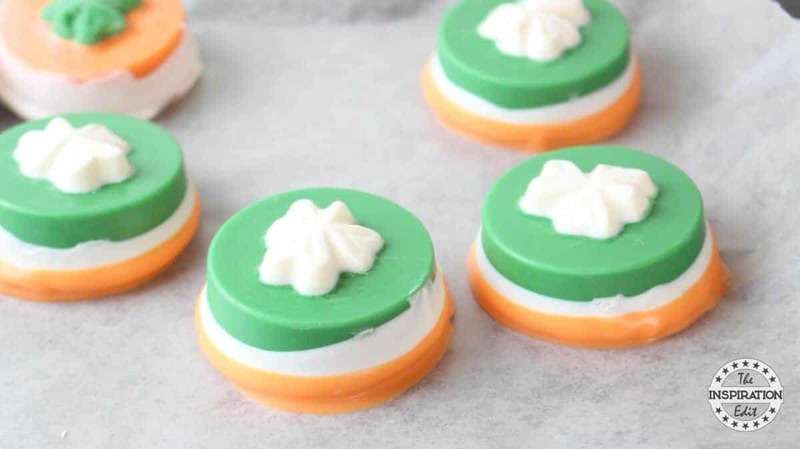 Once ready you can enjoy these tasty Saint Patricks Day Shamrock Oreo cookies. 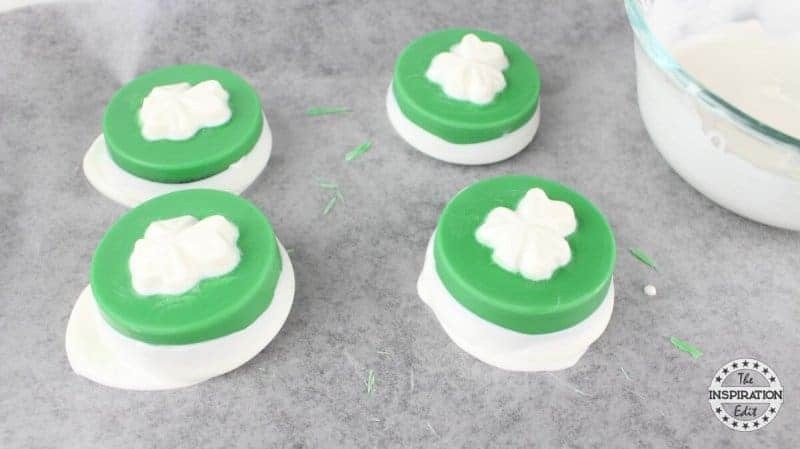 Chill the cookie molds for 10 minutes to allow the green chocolateshamrocks to harden.